Small Wind Turbine – – – Your source for affordable small wind turbines and small wind turbine hardware systems, controllers, supplies. 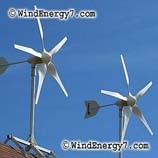 Inventor of the RoofMill™ home wind turbine kit, small wind turbines are our main expertise. WindEnergy7 has more options for small wind turbines because of our many innovations with inventions and patents making small wind power possible. We are not an importer, we are a manufacturer featuring durable american steel manufactured in Ohio USA. With an installed base from California to New Jersey, Europe, and canada, our all weather systems are ready for your environment. The RoofMill Small Wind Turbine is a roof mounted wind turbine designed to be a sustainable wind energy solution for any home. http://WindEnergy7.com – This Kansas wind turbine installer and dealer for WindEnergy7 has recently installed the most advanced hybrid home energy system in the US, the Home Wind Farm™. The system has a maximum power output of over 10kW. This Home Wind Turbine system features redundant charging capability, integrated wind and solar hybrid generation, emergency battery backup for the home and more. The pictures below show one of our most recent installations of our Home Wind Farm™ systems. The Home Wind Farm™ system is an exclusive innovation of WindEnergy7 LLC, an Ohio based manufacturer of home wind turbines and solar electric products. Whether you need a TowerMill™, or a RoofMill™, WindEnergy7 systems are all designed as integrated hybrid wind/solar power. This is another innovation of WindEnergy7 LLC system design. Our Jumbo Solar Panels upgrades shown below put out 197 watts per panel and add the reliability of solar charging to the systems. Our great big WindEnergy7 high output polycrystalline modules are working in tandem making our system much more consistent and reliable at delivering energy every day. In cases of low wind your solar power will continue to deliver energy. Compared to a home solar only system, our wind turbines make power at night, on cloudy days, and when there’s heavy overcast storms. We have 4way™ Emergency Power which is another hallmark that makes a WindEnergy7 system better than any competing home energy system. With our systems you have 4way™ Wind. Solar, Battery Bank, and Grid as sources for power when you need it and your home will have power with or without the utility company. Since this Home Wind Farm™ features redundant systems, this home even has power if a turbine system were to get knocked out or fail, there are two complete systems that can each run without the other. 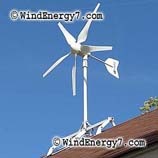 http://WindEnergy7.com – The wind turbine video shows the wind turbine noise of a home wind turbine kit from WindEnergy7 LLC, an Ohio based manufacturer of home wind turbine kits. Although it’s long proven that wind turbines on a roof will cause wind turbine noise and vibration, this patent pending system invented by WindEnergy7 is a proven quiet system. Other systems do not have the same technology that makes this possible, that’s why WindEnergy7 has developed and patented this system. The RoofMill™, is the invention of WindEnergy7 LLC founder, pictured in the video. This patent pending invention released last year has won the Think Green Design Award 2010, in a contest by Allied Electronics. RoofMill™ Advance Home Energy System, it’s a grid tied home wind turbine generator together with rooftop solar panels in a complete “Whole House” system. It has emergency UPS for your home and can run your meter backwards selling unused power. These systems are successfully installed from Hawaii to Massachusetts, Canada, Europe. The wind turbine noise is minimal and making the systems neighborhood friendly to be adopted in urban and suburban neighborhoods. 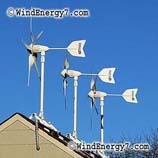 This is the best system for home wind turbine use because the wind turbine noise levels are at an acceptable level.